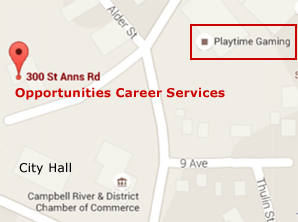 Opportunities Career Services is a career management organization located on the east coast of Vancouver Island in the scenic, ocean-side community of Campbell River, British Columbia. Our programs and services are also available to the residents of nearby communities Gold River, Sayward Valley, Black Creek, Quadra Island and Cortez Island. Since 1985 we have been sponsored by a non-profit society and our mission is to promote self-directed career/life management. Opportunities Career Services has been successfully delivering employment services and programs to the community for 30 years. We believe in an interactive, cooperative team approach, and provide professional, confidential and supportive career management services. of labour market opportunities in our area and to assist and support employers in talent recruitment and retention.